Tag Archive | "Omaha Beach"
With a relatively short window of opportunity in the midst of adverse conditions and against long odds, a decision is made that changes the course of history. If you are thinking that this could be the plot of an excellent movie, you might be right. In actuality, however, this is the storyline of what would come to be known as the beginning of the end for Adolf Hitler and Nazi Germany in World War II. Sixty-eight years ago today, General Dwight D. Eisenhower ordered the Invasion of Normandy, France. 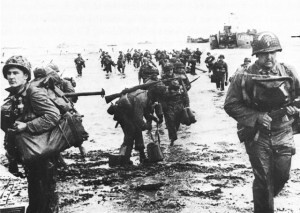 Dubbed Operation Overlord, the D-Day invasion opened a second Allied front in the European theater that overextended and drained Nazi resources. The timing of the Invasion was critical, requiring a day proximate to a full moon providing nighttime illumination and the deepest possible water via a spring tide enabling safe navigation around defensive obstacles placed in the surf by the Germans. Originally planned for June 5th, the Invasion was delayed by bad weather and very nearly had to be scuttled until the next full moon. General Eisenhower, Supreme Commander of the Allied Expeditionary Force, agonized over the decision. When his chief meteorologist forecast a brief improvement in the weather for the 6th of June, Eisenhower gave the go-ahead for the largest amphibious invasion transported by the greatest armada assembled in the history of the world. By dawn on June 6th, more than 18,000 parachutists – members of U.S. and Allied Airborne Divisions were already on the ground, having been dropped behind the beaches to thwart any potential reinforcement of German troops defending the beaches. The land invasion began at 6:30 AM. British and Canadian forces overcame light opposition in the capture of the beaches code-named Juno, Sword, and Gold. Likewise, American forces captured Utah Beach with relative ease. 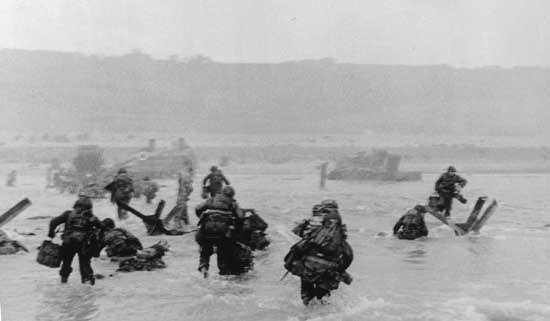 Omaha Beach was also wrested from the Germans, but at a cost of 2,000 American lives. 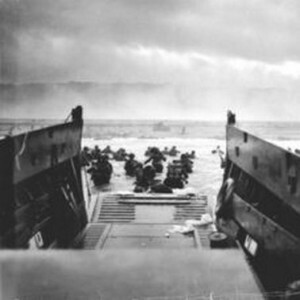 By day’s end, more than 155,000 allied troops had stormed Normandy’s beaches. By month’s end, the Allies had 850,000 men and 150,000 vehicles in Normandy and were poised for the quest to recapture Europe. All, however, did not go according to plan. One of the keys to the invasion’s success was the taking of the French city Caen by British General Bernard Montgomery. When this was not accomplished promptly, the Allied advance in the hedgerow country of southern France was stalled but ultimately succeeded. Within less than a year, victory in Europe was achieved. The costs were high, but the price of freedom has always been dear throughout the history of mankind on this planet. And, the landscape of Normandy remains to this day a testament to the heroism of those who paid the ultimate price in defense of freedom. The beaches still retain their code names and cemeteries containing the remains of the fallen dot the landscape. Many veterans and family members return to remember and honor the many who served and those who lost their lives that fateful day. The French people, particularly those of the Normandy region, will never forget the men and women who liberated their country at the cost of their lives. Over time, memories fade as do the numbers of living World War II veterans, One can envision a day in the not too distant future when there may be no living veterans of World War II. With no direct participants to keep the memories alive, perhaps the D-Day Invasion will be buried in history books and largely overlooked by the general public. Yet, to the living World War II veterans, the War is indelibly etched in their minds and hearts – never to be forgotten. They were boys who, after 15 weeks of training, were doing a man’s job. And, their heroism saved the world from Nazi tyranny.